Much of the heat produced by a traditional fireplaces ultimately goes up the chimney, taking your energy dollars along with it. For a warmer and more wallet-friendly fireplace, consider one of these modifications. Did you know that only about ten percent of the heat from a fire in the fireplace makes it into the room? That’s right, about ninety percent of a fire’s heat goes right up the chimney. Not only is the heat going to waste, but that draft of hot air is also pulling heat from the room along with it. Your home heating system then has to work harder to maintain the desired temperature. That’s a lot of energy, and money, going up in smoke. The good news is there are several ways to retrofit a working fireplace into an energy producer, not an energy waster. A quick fix is to add glass fireplace doors—they’re easy to install yourself and they’re a simple way to reduce heat loss, but the result is still only about twenty percent heat efficiency. And who needs eighty percent of their heat going up the chimney? A better option is to retrofit your fireplace with a stove insert that burns either wood or pellets, or with a gas fireplace. 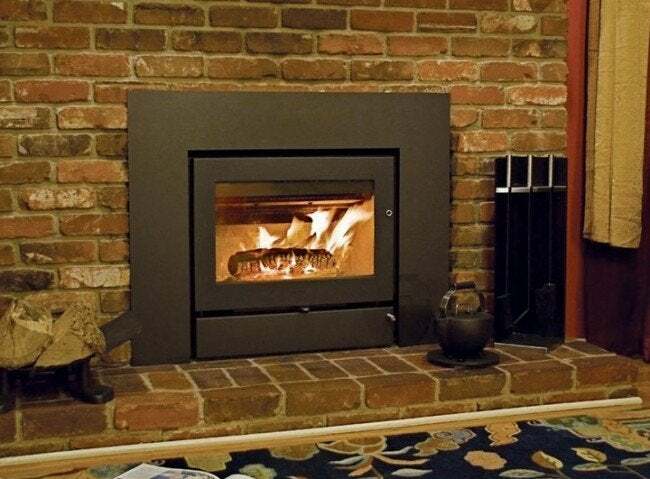 Any of those options can turn your fireplace into a bona fide heat source. Wood and pellet stoves have the charm of an actual roaring fire, but you’ll still have the work of feeding them fuel and cleaning up the ash. A gas insert burns cleanly, leaves no ash, and produces lots of efficient heat for your home.